To find The Happies, I went down a narrow and silent alleyway to a little house with few lights on inside. There, I found The Happies and we proceeded to have a muted conversation. The various Happies were so soft-spoken that often, the recorder didn’t pick up their voices, despite there being no traffic outside and no music on inside. The Happies were meant to continue because Miles survived. 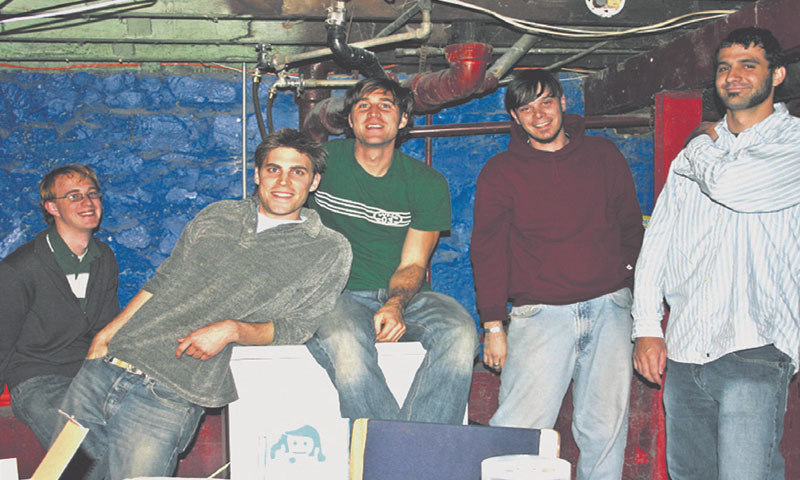 The Happies were initially a recording project, but they started playing outside at bars and parties and discovered how much more enjoyable it is to play for people. They like people hearing their music so much that they sell their CDs for $1 each, although they tell me they have given them away for pocket change or IOUs. Meet the Happies is beautiful. It sounds like a haunted video game. Ki was once long-boarding through Liberty Park when he saw a band playing pretty music next to the Four Canyons fountain. He watched them for a bit before asking “Do you guys need a mandolin player/keyboardist/third guitarist?” but, Ki tells me, the musicians just smiled and continued playing. But eventually Ki ran into Miles again somewhere and effectively talked his way into the band. Linwood describes Ki and Miles them as the Paul and John of the band. “We’re really interested in melody, and we try to make out music about it,” Miles drones. “The melody is a defining part of The Happies. The songs get stuck in your head. But you want them to be stuck in your head. I find myself singing them in the shower,” Ki tells me. They offer me what they refer to as “Happies Stew,” with the addendum that said stew is at least a week old, but I refrain from trying it.